With tickets going on sale today, this is a big one! Having apparently sold out two dates in Manchester and a night at London's Royal Albert Hall in a matter of minutes, Haçienda Classical's first Scottish concert comes in conjunction with UK promoters, Colours, at Glasgow's SSE Hydro Arena on Friday 22 April. The events sees FAC 51 The Hacienda and Manchester Camerata collaborate with the DJs who shaped The Haçienda's sound – Mike Pickering and Graeme Park. 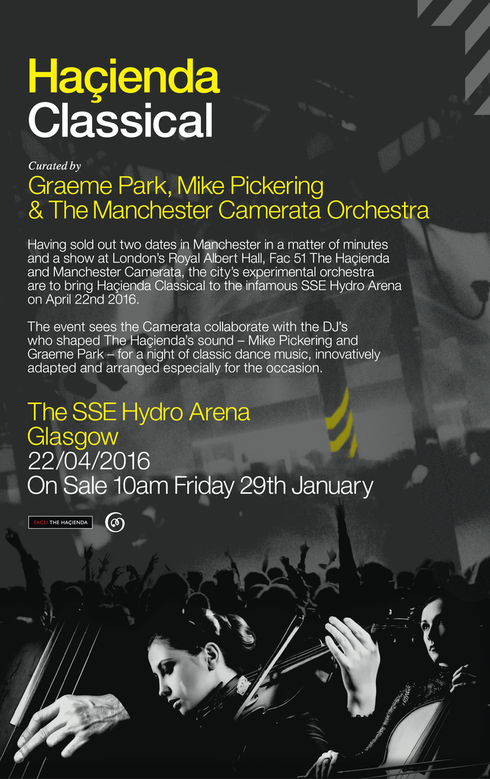 The SSE Hydro Concert sees the DJs perform a continuous set of signature Haçienda tracks alongside the orchestra performing in this innovative live fusion event. Manchester Camerata is possibly one of Europe’s best chamber orchestras, with an ambition to redefine what an orchestra can do. Known for their performances and collaborations, Camerata collaborates with a wide spectrum of artists, from classical legends such as Martha Argerich to iconic bands like New Order. Their work in the community uses music to promote positive change and personal social development across three specialist areas: young people in schools, health and wellbeing, and their youth programme. As you would expect with an event like this, anticipation for the Glasgow date is already high and with tickets on sale now, this looks like being a fantastic night in one of Glasgow’s premier concert venues.